SAKE, KIMONO, and TABI: I want a sake warmer! As the autumn advances and it gets colder, delight of warmed sake increases. I like drinking warmed sake while grilling dried fish on a shichirin (small desk-top charcoal brazier) and nibbling it. However, it is bothersome and spoils the pleasure to bring back an empty sake flask to your kitchen to make another helping. So, you need something that allows you to continuously enjoy your drinking without leaving your seat, or some device with which you can prepare warmed sake at the table. More specifically, it can be a douko (sake warmer used in a nagahibachi) and nagahibachi (brazier used indoors for heating). Otherwise, it can be a household-purpose small-sized sake warmer. Incidentally, a commodity called mini-kansuke uses just hot water to warm up sake and does not have a heating system, so it may be useful if you do not drink sake very much and you don't need to make many helpings of warmed sake. However, it is not very useful for heavy drinkers since the water in the mini-kansuke soon cools down. Of all types of such sake warming devices, what I want to get is a copper kandouko (sake warmer) sold by Daikokuya. The kandouko holds some amount of water in it, warms the water with heat of charcoal fire also burning inside this device, and warms sake with the warmed water. 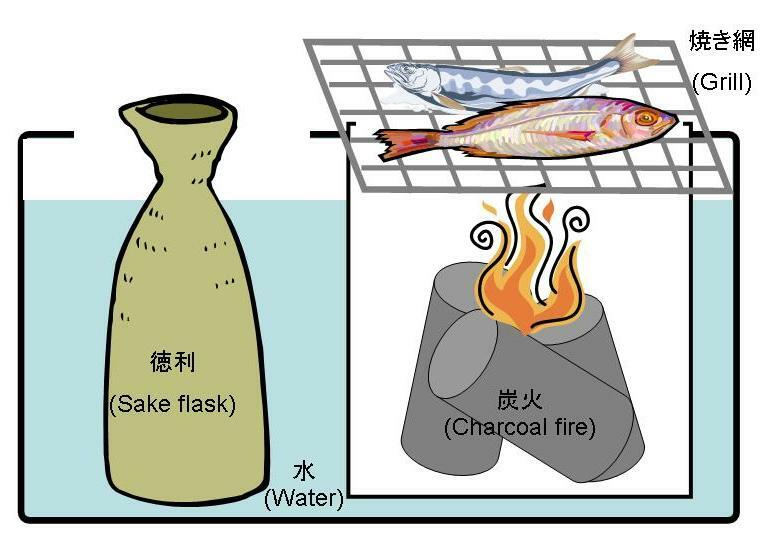 While warming sake, you can also cook some foods such as dried fish on the grill placed over the charcoal fire. It seems perfect for my requirements, doesn't it? However, it is priced at 126,000 yen, and I am hesitating about whether to purchase it. The combination of a nagahibachi and douko also seems a cool setting for enjoying warmed sake. They function by the same principles as Daikokuya's kandouko mentioned above. 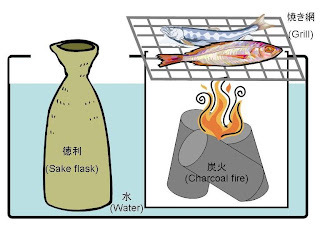 The douko is placed on the burning charcoal in the nagahibachi so that the water contained in the douko can be warmed and, subsequently, the sake in a flask sunk in the water can be warmed up. Maybe, I can buy them through an Internet auction less expensively than Daikokuya's kandouko. However, a nagahibachi is big and heavy and it is not very convenient to use it on a table. For now, I use a small electric pot to warm up sake. Although it is not so elegant as a douko, nagahibachi, etc., but it is anyway useful. Yesterday, I used this electric pot to warm up a sake carton as shown in the movie below. I jut put the sake carton in whole and drank it. This is maybe a rude and wild way for preparing warmed sake, though. Came across your blog today, very much enjoying it. I also want a sake warmer! Nice. I'd do the same thing if I were drinking from a carton. It works. It's a pity we do not see these sake warming devices very often lately due to change in Japanese poople's life style. Thank you for the comment, Tony. Let's enjoy warmed sake. I think warmed sake is a homey way for enjoying sake. It warms up your body and heart. Ichibay, inspired by this post, I have made a "kandouko" - please check it out! I read your post about your making a kandouko. You did a great job!